The strong partnership between the Love & Company team, coupled with our sales and operations teams, was a true collaboration. They kept us keenly focused on our targets and aggressively worked with us to reach our goals. Their guidance and insight, coupled with our talented internal team, really helped drive the unprecedented success of this project. Our relationship began with Westminster Baldwin Park following a successful partnership that helped achieve record goals during an expansion for another nearby Westminster Communities of Florida community. This partnership started as Florida’s largest network of retirement communities—with 60 years of serving seniors—wanted to expand its Winter Park community by adding a satellite campus in nearby Baldwin Park. This new community would offer an enviable, active lifestyle coupled with an on-campus rapid rehabilitation center. First steps included collaboratively developing an overall marketing plan and brand strategy for this new community, working in partnership with the client’s skilled, on-site sales, corporate marketing and PR teams. Together, we implemented and managed a successful marketing program that far exceeded expectations within the first year. 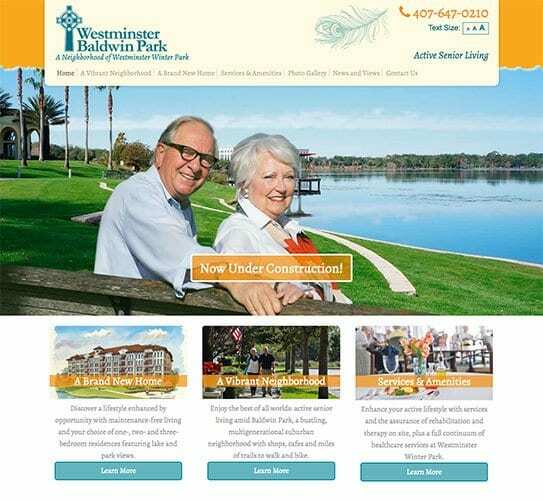 Westminster Baldwin Park’s web strategy was designed to both drive new leads using best practice SEO tactics and to capture and engage new leads as they visited the site. 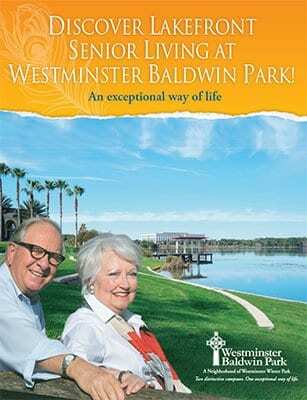 The website featured real Westminster Communities’ residents at the forefront while showcasing the local Baldwin Park area. The community’s features and competitive advantages were highlighted in a compelling, easy-to-navigate format. The site also allowed for interested prospects to request information online and to instantly receive a digital brochure or sign up for an e-newsletter. This was a way to maintain consistent engagement with the most interested visitors, who would continue receiving automated emails that would tell a deeper story about the many benefits of Westminster Baldwin Park. The unique challenges of marketing a project under development created a need for an attractive, compelling sales package—one that could be customized and modified as the project progressed. The collateral was designed to be flexible enough to track changes to the project as it developed, and to provide a customized package for each prospect it was sent to. One priority of the overall marketing strategy was to host events that would encourage unique, meaningful engagement of prospective residents. 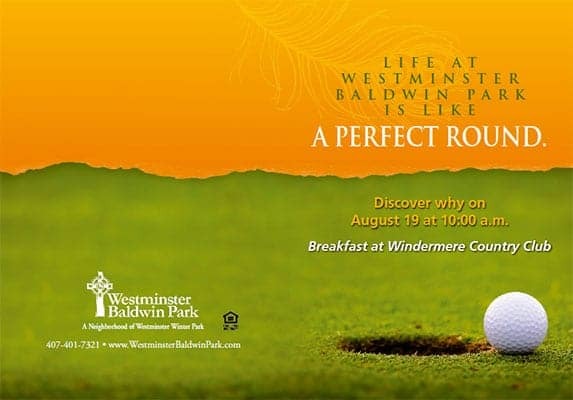 Focused and targeted events, such as art discussions and themed coffee chats, helped provide ways for prospects to learn about Westminster Baldwin Park’s enviable lifestyle while also satisfying a passion for their own unique interests. Westminster Baldwin Park utilized advertising and public relations pieces in various area newspapers and magazines to communicate a message of scarcity and urgency. The resulting tactics told the compelling story of the community, drove the scarcity of specific floor plans and allowed prospective residents to tell the community’s story in their own words. 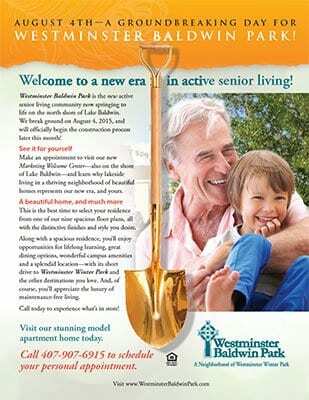 Westminster Baldwin Park celebrated being 100% reserved within their first year of marketing, a full year ahead of schedule, and they are continuing to add to a growing wait list of more than 40 prospects. The focus on targeting younger, more active seniors in the campaign also paid off, with the average age of seniors moving to Westminster Baldwin Park being six years younger than expected, and with a majority of homes being reserved by couples. The wait list and lead base continues to grow as prospects anticipate a potential next phase, or await availability of a home in the current phase of construction.